had representative teams out west. Major stars who developed in the PCL include Joe DiMaggio and Ted Williams. The league went into decline when the Brooklyn Dodgers moved to Los Angeles and the New York Giants to San Francisco, and lives today as a Triple-A league with teams from the Midwest to the West Coast. Five balls were to be dropped from the Goodyear blimp hovering overhead. The balls were scheduled to be dropped during festivities at a nonleague game on San Francisco's Treasure Island, then hosting the world's fair -- the Golden Gate International Exhibition. Sprinz missed the first four balls. But on the fifth, the blimp's captain, A. J. Sewell (an ace bomber pilot during World War I), said he "thought that Sprinz had it." He added, "From the ship [blimp] it looked as if it hit his glove first. ... He walked quite a ways and then sat down. Then some persons crowded around him and we saw him lying down." A University of California mathematician calculated the ball was traveling at 145 miles an hour when Sprinz made his catch. "Few realized just how close Joe Sprinz stood to death in that fleeting split of a second when the ball crashed through his upraised hands," Borba wrote. The force of the ball gathered as it descended from the blimp, tearing Sprinz's hands apart, allowing the ball to crash against his face. Even today, 75 years later, the physicist David Halliday uses the event as an example of terminal velocity in his physics textbook The Fundamentals of Physics. 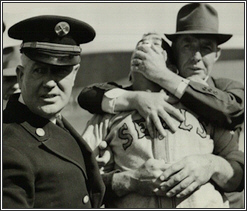 March 25, 2014 -- Baseball catcher Joe Sprinz "staggered a few steps, as he grasped his mouth with both hands. 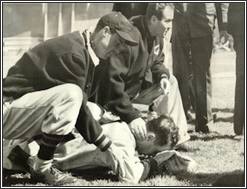 He fell forward and writhed in agony as his teammates rushed toward him." The description by Harry Borba, a sportswriter for the San Francisco Examiner, was describing a publicity stunt in 1939 that coincided with the 100th anniversary of baseball. "When he fell, face forward, a muffled groan [from the crowd] went up," Borba continued. A few days earlier, Lefty O'Doul, the manager of the Pacific Coast League's (PCL) San Francisco Seals, had announced that Sprinz would attempt to establish the world record for catching a baseball dropped from the highest height ever -- 800 feet. It would occur during a baseball game before a crowd of 15,000. Coincidently it was Sprinz's 37th birthday too. In August 1939, baseball catcher Joe Sprinz's attempted to set the world record for catching a baseball dropped from the highest height ever -- 800 feet.